It used to be that customers had one basic cell phone that they used just to call or text people, and they would contact the phone’s support center when things went wrong. Those days are long gone. Today’s customers have multiple devices that are constantly connected, and they can interact with tech companies for more than just support questions. As the technology and mobile world changes, Samsung is also changing its attitude towards customer experience. Instead of what SVP Customer Care Michael Lawder calls the “break, fix model” where customers only came to the brand to fix their broken devices and then got on with their lives, Samsung is now focused on building lasting, meaningful relationships with its customers that go beyond the one-off service fixes. The idea is that as customers become more connected with their devices, they can also become more connected to the brand. More devices means there is more chance to build loyal Samsung customers for life. Samsung does this by aiming for high-quality customer service through a number of channels. It recently unveiled its truck on the streets of New York City that can service customers similar to how a food truck operates. If a customer needs help setting up their device, their screen to be fixed, or just a place to charge their phone, they can come aboard the truck and get the service done for free. Samsung is also expanding its chatbot ability by using bots to efficiently direct customers to a real person who can answer their questions. Although Michael admits the technology isn’t completely there yet, the idea is that bots will be able to streamline support requests by texting customers a few questions to point them to the right human support agent. Future chatbots will be able to gather more information about customers, which will lead to more customized experiences. Samsung’s new focus on the end-to-end customer journey means that the focus isn’t just on selling a product or fixing something when it’s broken—it’s on building relationships throughout the entire customer journey. Building relationships that solve problems and improve customers’ lives means that Samsung has to put resources into its programs. By delivering amazing experiences, studies have shown that customers invest more in the brand, which leads to a huge ROI. The internal Samsung motto for service is “Done plus one”, meaning that not only is the problem solved, but employees have the power and are encouraged to go above and beyond to delight customers and make them Samsung fans for life. It’s not just customers who are connected to the products—employees are as well. Samsung lets its employees, especially those in the service areas, use their products for personal use so they can fall in love with them and naturally want to provide amazing service. The hope is that employees will be fueled by their own passion for the brand and products and want to share that with customers. Customers are more connected than ever before, and that connection will continue to grow with the IoT and as more devices become available. 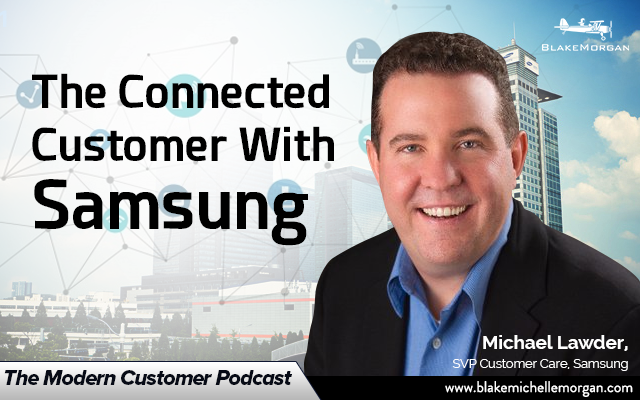 Companies like Samsung know the power of staying in touch with these connected customers to help them not only connect to their devices, but also to connect to the brand.